In the smallest state in the country in a small town named Pawtucket (don’t you dare pronounce it PAW-tucket, it’s P’tucket), there’s a small restaurant called Garden Grille. On the menu at Garden Grille there is an inconspicuous looking little item: the butternut squash quesadilla. As anyone who has ever ordered the quesadilla can tell you, that tasty treat will take you as close to heaven as a vegetarian Mexican-inspired menu item can. 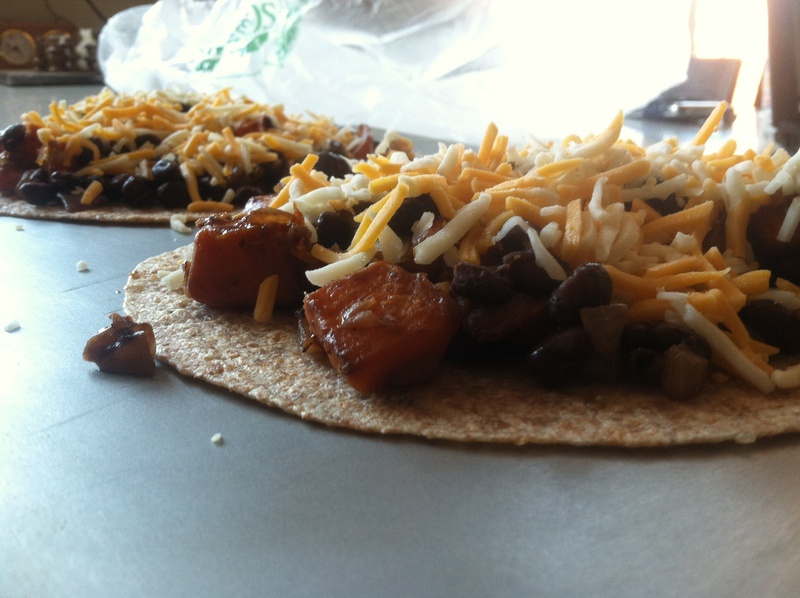 Crispy tortilla filled with creamy avocado, smooth butternut squash, black beans and, of course, cheesy goodness. About halfway through you have to make an important choice: do you eat yourself into a food coma, savoring the crunchy, creamy quesadilla, or do you take half home to enjoy for lunch the next day. It’s an important choice, and not one to be made lightly. 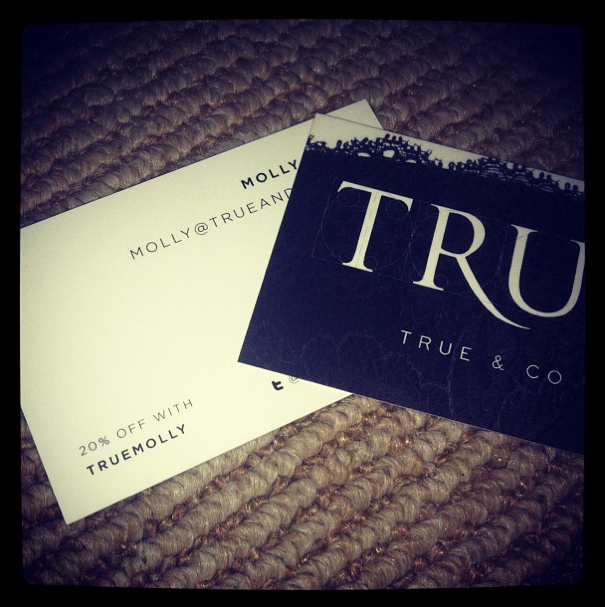 Having (temporarily?) left the small state of Rhode Island I’ve found myself craving that butternut squash quesadilla like no other. So naturally I set out to recreate the meal I so badly wanted. I feel the need to include the disclaimer that due to limited funds and poor planning I didn’t make them exactly the way the master chefs at Garden Grille do. Jack cheese just isn’t versatile enough for me to buy it for one recipe, so I got a shredded jack and cheddar combo. I forgot to get an avocado, and made do without. In its place I included some red onion since that was pretty much all I had. But alterations aside, it still turned out to be a pretty tasty meal. Plus it put me oh so on trend with the whole “meatless monday” deal, and made me feel very autumnal. Started out with some butternut squash. Cried while chopping onions. Put the onions on the stove as punishment for making me cry. Beans, meet onions. Onions, meet beans. And have you met my friend butternut squash? It’s not mexican food without tortillas and cheese cheese cheese. I usually make my quesadillas on the stove, but I put these ones in the oven and I was glad I did since it made much less of a mess (no flipping and trying to keep the squash inside the tortilla while also trying not to burn my fingers). Sadly, quesadillas aren’t exactly beautiful at the end, and don’t make for great pictures. They are, however, delicious with a little bit of salsa. If you’re a sour cream kind of person, by all means add some of that too. Perhaps some avocado as well. Get wacky. I thoroughly enjoyed my meal, and now I’m pretty sure I’m going to devote myself to recreating the entirety of the Garden Grille menu. Korean Tacos, I’ve got my eye on you. 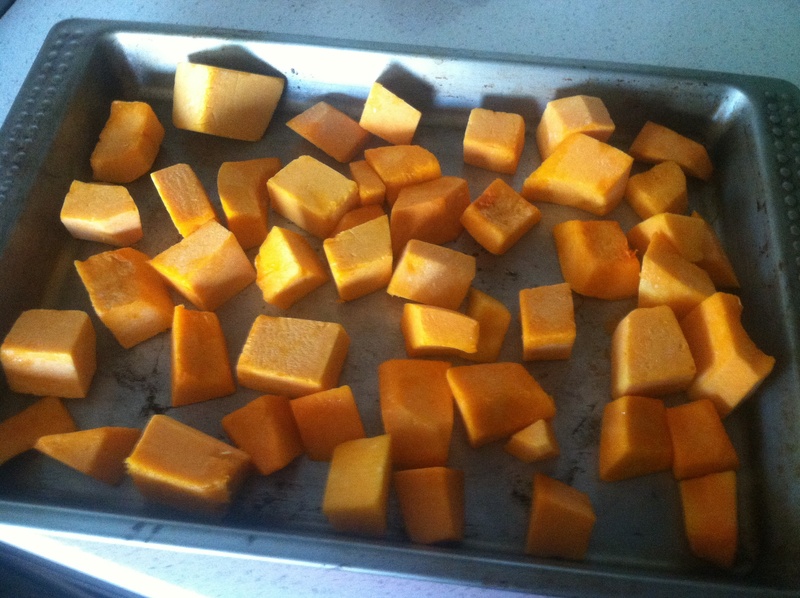 Place squash on a pan and coat with 1 Tbs of olive oil. Season to taste with salt. 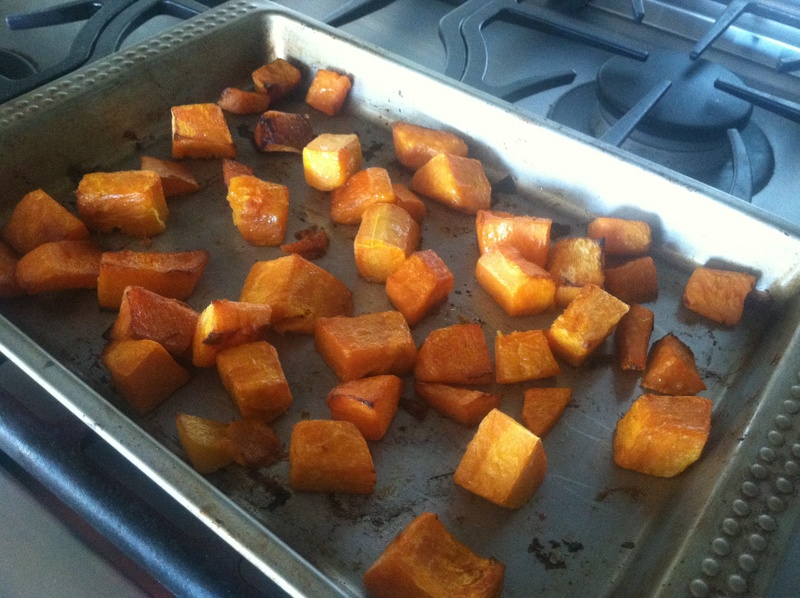 Roast the squash 45 mins to an hour, depending on the size of your cubed squash, stirring occasionally. Remove from the oven and set aside. Turn the oven down to 350 degrees F.
Meanwhile, heat a drizzle of olive oil in a skillet. 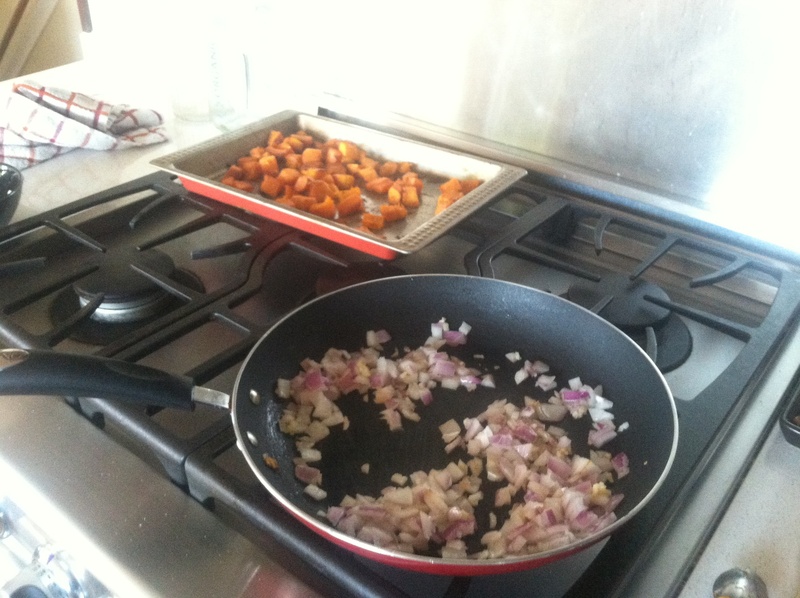 Add garlic and onions, cooking until the onions are cooked, 3-5 minutes. If using red pepper flakes add these as well, to taste. 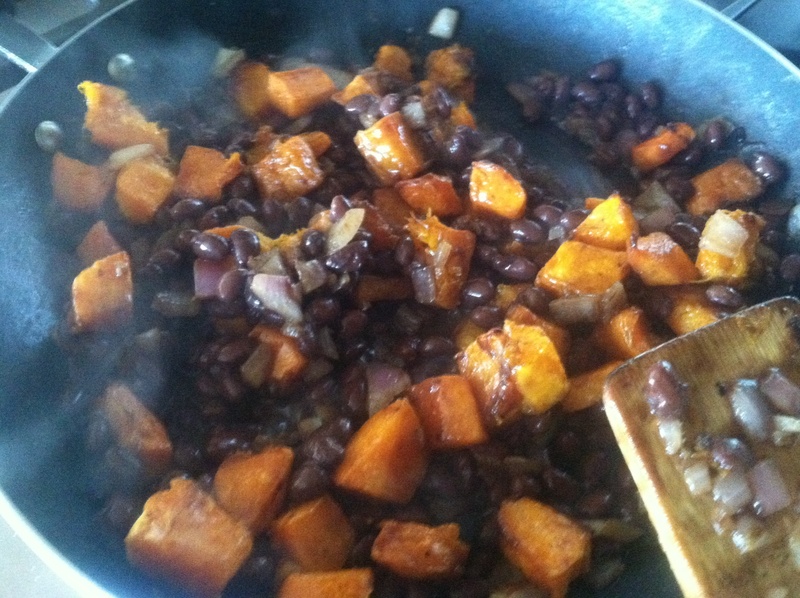 Add the beans & butternut squash, and cook until heated through, stirring. Brush three of the tortillas with oil and place them on a baking sheet. Top each tortilla with the squash mixture. 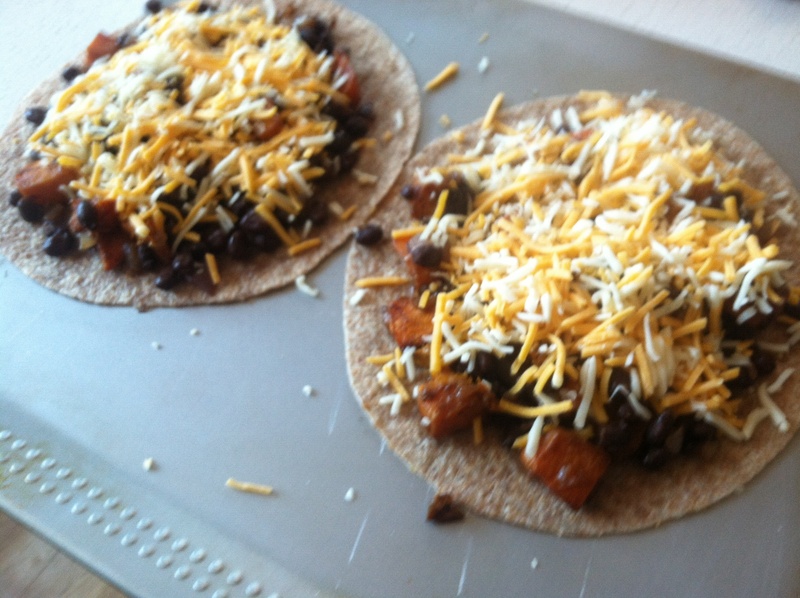 Sprinkle with the cheese, dividing evenly between them. Top each with another tortilla and brush that with olive oil. Put those babies in the oven and bake 12-15 minutes, until the tortillas are golden brown and cheese is melted. Serve with salsa and sour cream. Like I said, I didn’t have avocado on hand, but if you want to include it just slice the avocado and add it on to the tortillas just before you sprinkle them with cheese. You’ll probably need to press down on the top tortillas a little to make them into one coherent, stuck-together quesadilla. I never cease to be amazed at how quickly the summer months can fly by. It’s August now which means the end to my month of travel and a return to the real world (or whatever you want to call my strange life in limbo). I had such a good month spending time with friends, catching up with family, exploring new places and eating my face off. However, after a month that included 4 flights, 2 train rides, 2 bus rides and a 6 hour drive to and from the wedding I must say it feels nice to just sit still for a bit. I got home after a red eye flight and bus ride back to Providence and immediately collapsed into my bed. The only downside to all my travels? I was in vacation mentality, which meant I was in vacation eating mentality, which obviously meant I ate more than my fair share of tacos and wedding cake and pastries and cheese and everything delicious I encountered, not to mention all the airport food. I was bad to my body. When I woke up from my nap/sleep hybrid I realized my body was screaming for vegetables and water. My goal: to incorporate as many vegetables as possible into my meal while still forcing myself to be adventurous. 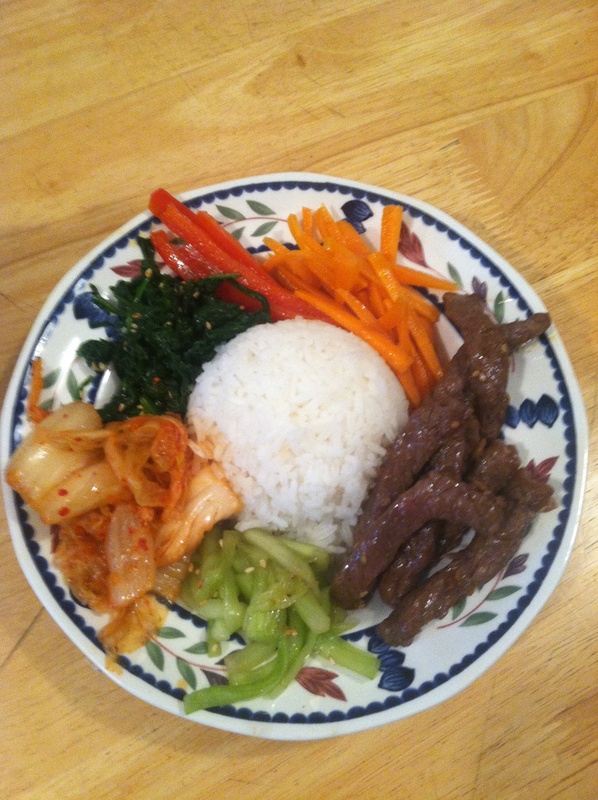 Which is how I came to make bibimbap for dinner. 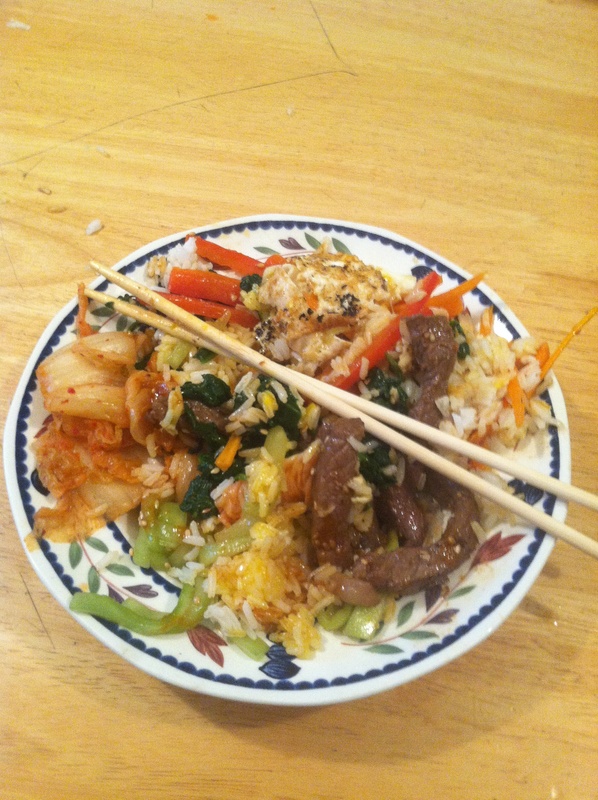 Bibimbap, for those who don’t know, is a Korean dish that literally means “mixed rice.” It consists of rice, vegetables and protein in the form of meat and an egg. The nice thing is you can use any vegetables you want, even if it makes the dish a bit less authentic. Traditionally it’s often made to use up leftovers since the vegetables are ones often served as sides with other things. It took me a while to make because I didn’t have any leftovers, having just returned home, and hot damn is it hard to julienne a baby carrot. 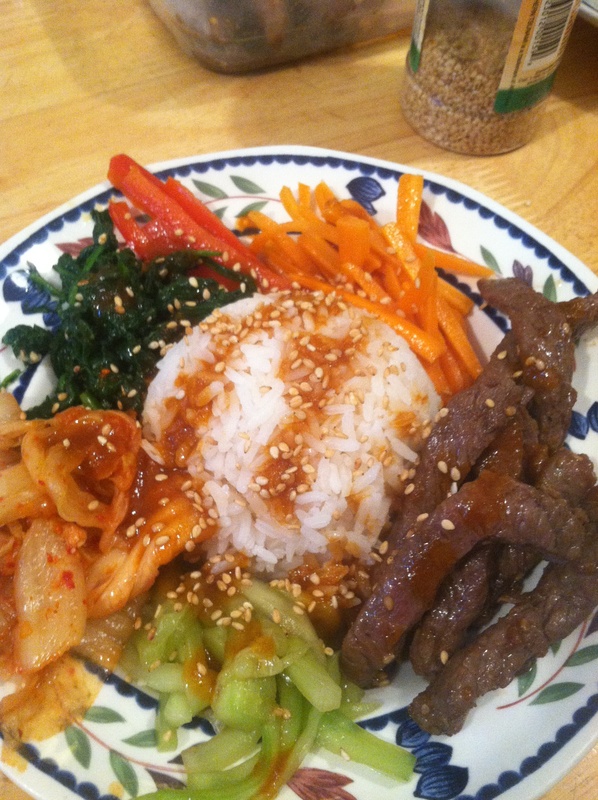 I also had to marinate the meat, cook the rice and prepare a few different vegetables. Let’s just say I didn’t plan my time very well (I was almost done with everything else when I realized I hadn’t made any rice). In the end though it turned out wonderfully, and it had the simple, clean flavors that my body was begging me for. 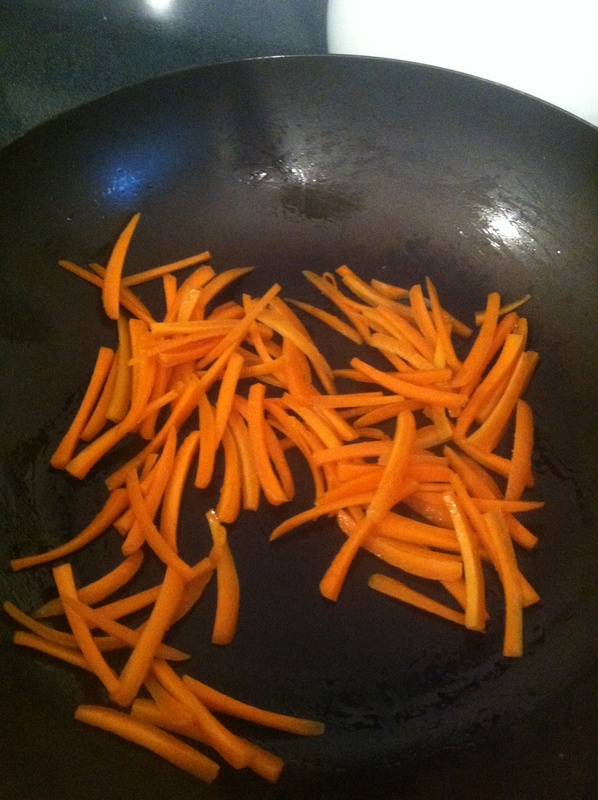 For vegetables I used cucumbers, carrots, spinach and bell peppers, with some baby bok choy on the side. The only real seasonings to the veggies came from a little sesame oil, garlic and sesame seeds, along with a bit of salt at the end. I also used kimchi, which-fun fact-is supposed to be amazing for digestion and health. I wanted some meat too so I used sirloin steak marinated in a bit of soy sauce, sesame oil, ginger, garlic and agave nectar. When I put it all together it looked so tasty. And I got my rice on my plate in such a nice round shape. 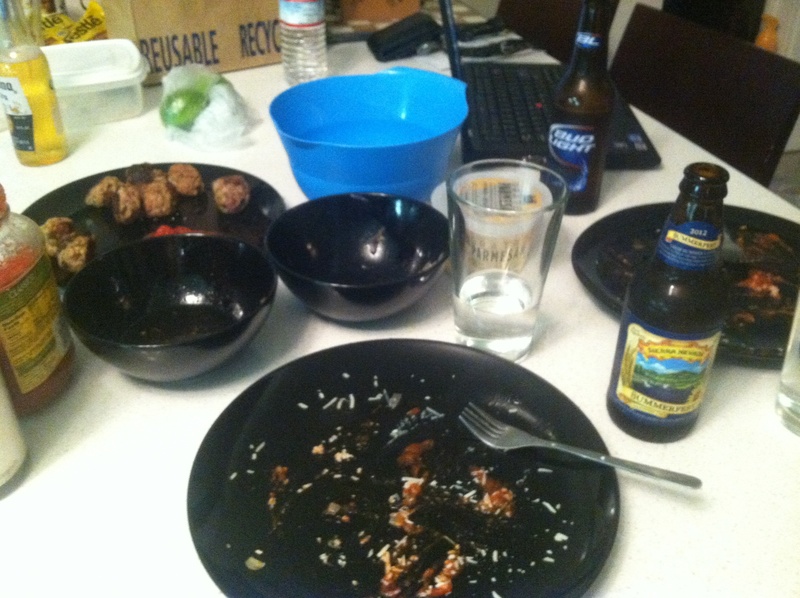 …If I sound proud it’s because plating is never my strong point. My supermarket didn’t have gochujang, the chili pepper paste traditionally served with bibimbap, so I improvised with some sriracha mixed with a dash of honey, soy sauce and sesame oil (a trick I found on this blog). And finally I topped it all off with a sunny side up egg. I’m much more of an over-easy girl myself, so on my first attempt I broke the oh-so-delicate yolk all over the pan. My second attempt, however, resulted in a perfectly sunny-side-up egg to top off my masterpiece with. As anyone who has eaten bibimbap knows, part of the fun of this dish is that it looks so well composed when you serve it, but then you immediately mix it all together when you eat it. That runny yolk gets mixed in with the beef and rice and veggies and it all comes together into one delicious messy dish. There’s really not much to it since the steps are: rice, veggies, meat, egg. If you want a little more direction than that (including which vegetables are most traditional), this post on Living and Eating takes you through the steps. 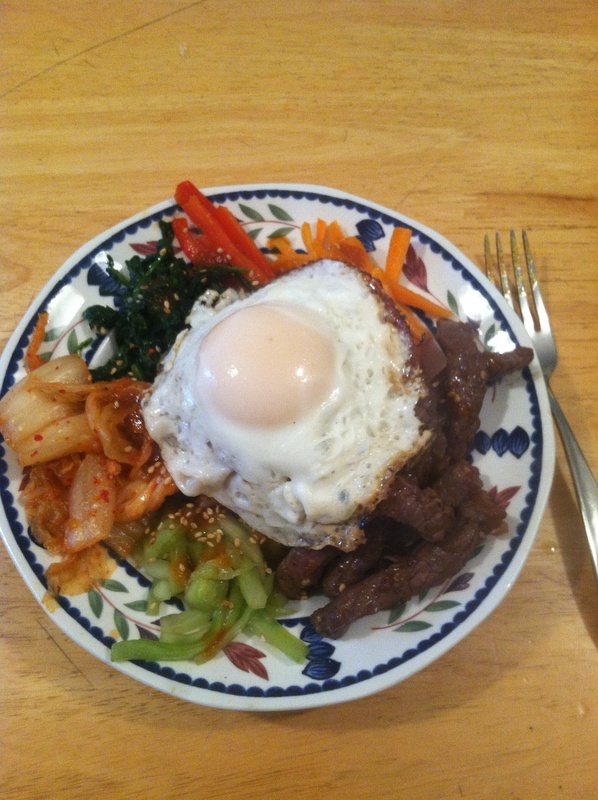 In the end, I’d call my foray into bibimbap a resounding success. It was more food than I needed (I didn’t finish everything on the plate), left me full for hours, and eased me back into a world of vegetables and simple food. Oh man. I don’t know how I didn’t know about this before, but My Fridge Food is my new favorite website. My life has largely revolved around food for the last week or so (making it, eating it, creating funny shapes on my plate with it), and in the midst of my usual quest for recipes on Pinterest I came across this site. You can pick which foods you have on hand and it’ll give you recipes based on what’s in your fridge. Many a night I’ve stood in front of my dwindling grocery supply wishing there was something I could make with tuna, potatoes and captain crunch. Those nights usually ended in Domino’s, and will probably continue to. But I love the idea of being able to pick the potential ingredients and have a recipe given to me. Continuing with my food-filled week, I started in on my goal of making foods I haven’t made before. 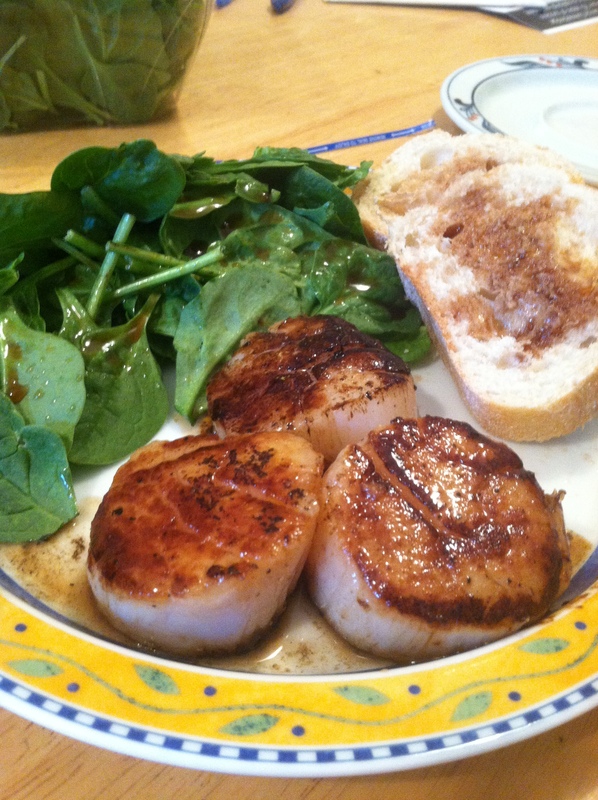 I was wandering through whole foods and saw the scallops so I figured why not. 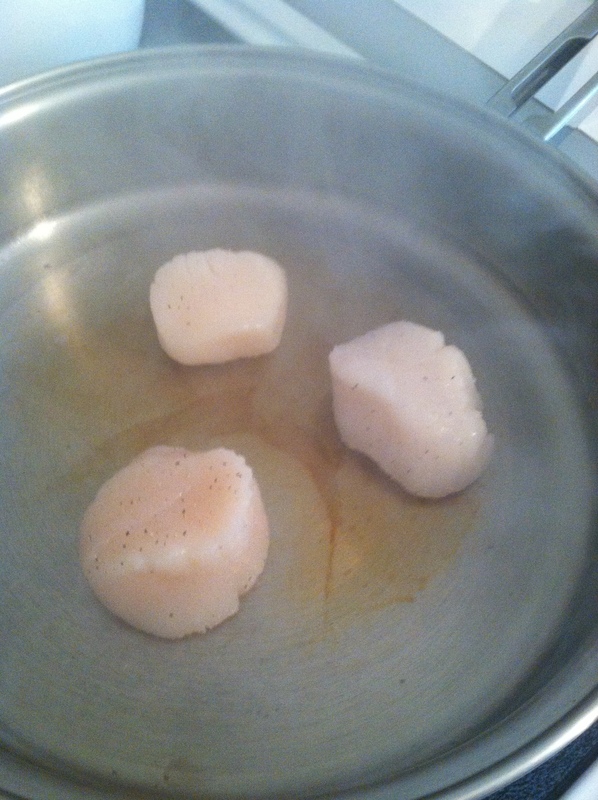 I may have inadvertently smoked up the entire kitchen in the process, but the scallops wound up being delicious. Smoke aside, they were also super easy. 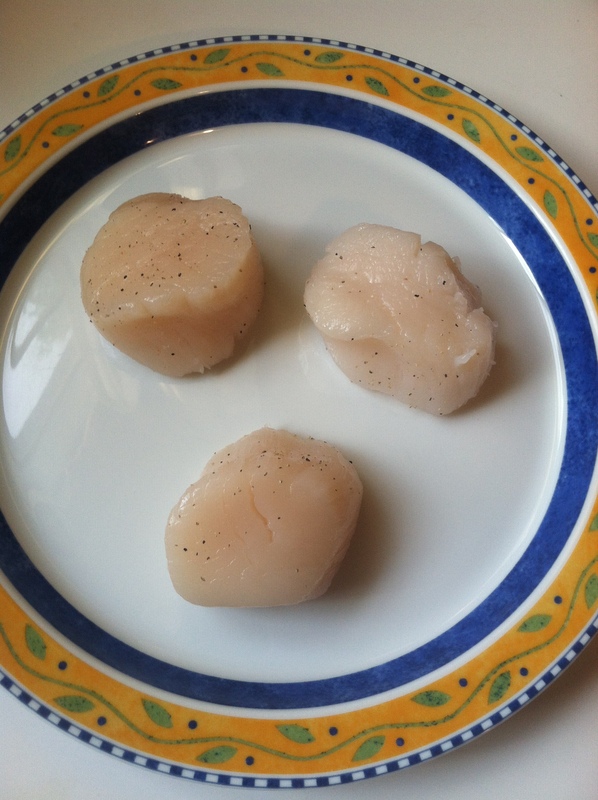 I’m loving being home and able to cook stuff like scallops because they tend not to fit so well into the college student budget. In the end they came out great! I served them (to myself) with a side salad of baby spinach and some french bread. I finished it off with some tiramisu from Whole Foods which I ate in my pajamas in front of an episode 30 rock. Totally channeling my inner Liz Lemon since graduating, right down to the treadmill/exercise aversion.